German Sauerkraut and Spareribs is a recipe I grew up eating at my mother’s kitchen table. 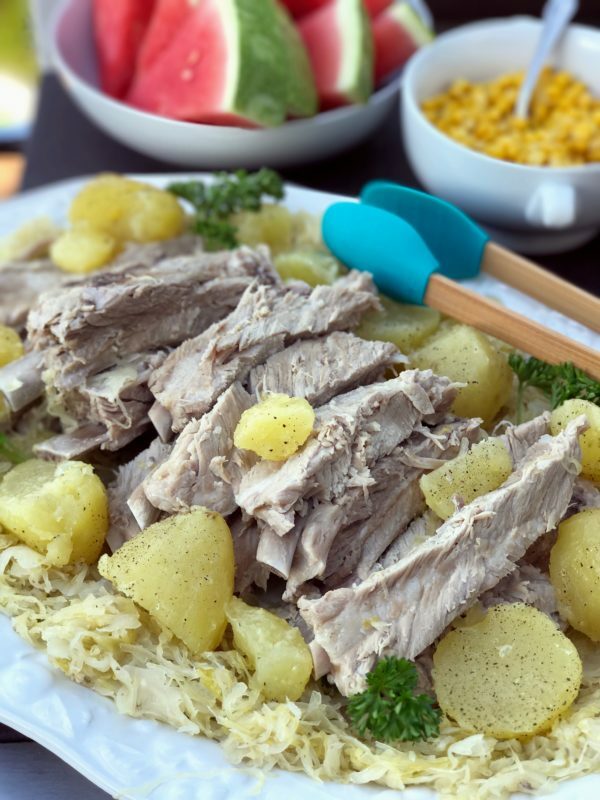 Slowly boiled pork spare ribs simmered in water and sauerkraut is an easy to make classic dish served in many German homes both in the United States and in Europe. 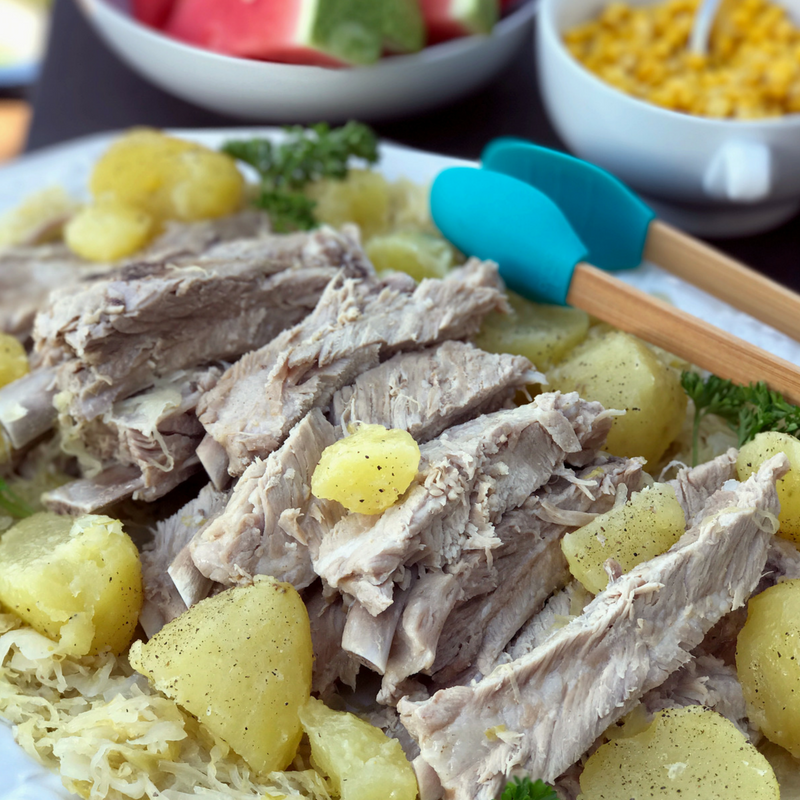 Serve it with boiled potatoes tossed in melted butter, salt and pepper, corn, and a slice of buttered white bread packed with the extra sauerkraut, (Sauerkraut Sandwich), and you’ll have yourself an authentic German dining experience in a little over an hour. My mom grew up during the Great Depression where food was scarce, and nothing wasted. 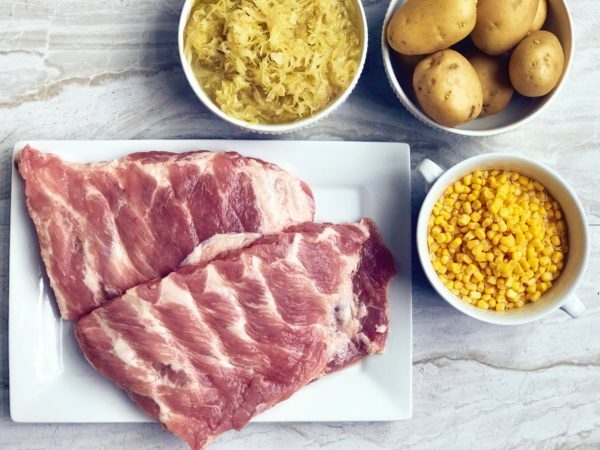 Making dishes like Sauerkraut and Spareribs for a large family was a staple meal in her home since this dish requires only a few ingredients and there’s not a lot of fuss in making it. It’s funny how childhood recipes can become a favorite, even after decades of learning to make foods from around the world. Familiar comfort food from times past feels like coming home again. Through foods and smells, our brains have the incredible capacity to remember the finest details of the past. To me, there is no better way to remember times gone by than a dinner that mom used to make. Often, recipes change and evolve with each generation, even the good ones. The change I made with this recipe was simple, but important. My mother used canned sauerkraut in her recipe. You know, the kind with a really long shelf life? Since those brands are packed with toxic, undesirable preservative and ingredients, I use organic raw sauerkraut by The Brinery or Bubbies. Tender fall off the bone pork spareribs slowly cooked in a juicy sauerkraut brine. Serve it with boiled potatoes sauteed in butter, salt and pepper, and your favorite vegetable and salad on the side. Just like dinner in Germany. 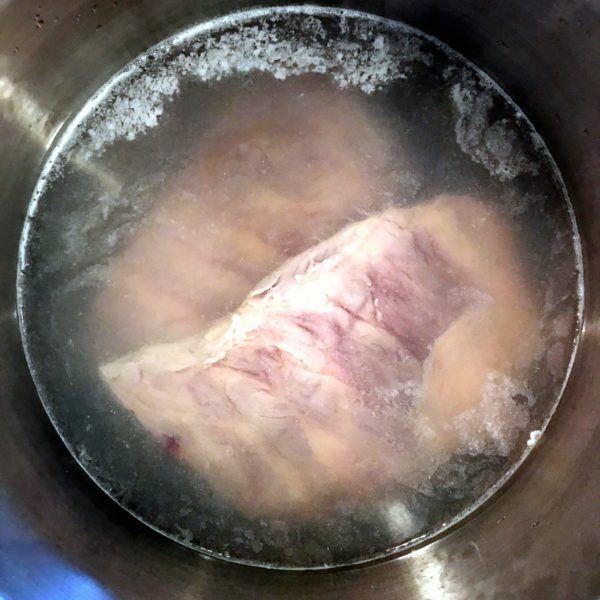 Wash ribs with cold water, cut slab in half and place in large pot filled with water just above the ribs. Add 1/2-teaspoon salt and bring to a boil on high heat. Reduce heat and boil on medium heat for 45 minutes. Turn ribs over at 20 minutes to cook evenly, removing any fats on top of water with a slotted spoon. 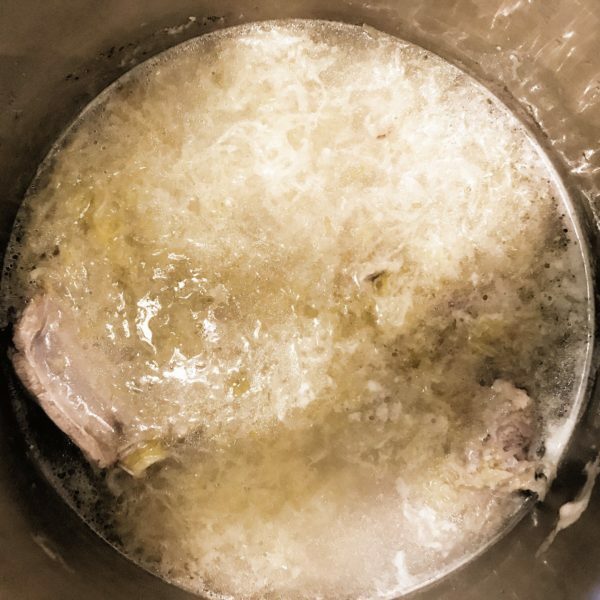 After 45 minutes, add sauerkraut to water, reduce heat to medium and continue to cook for an additional 45 minutes. 30 minutes before ribs are done, bring a medium pan with 6 cups of water to a boil over high heat. While water is heating, peel and halve potatoes. When the water begins to boil, add the potatoes and remaining 1/2-teaspoon of salt to the water, reduce heat to medium-high and boil for 20-25 minutes or until the potatoes are soft when pierced with a fork. Drain the potatoes in a colander and transfer back into pan. Place pan on stove, add 2 tablespoons of soft butter, sprinkle with salt and pepper. 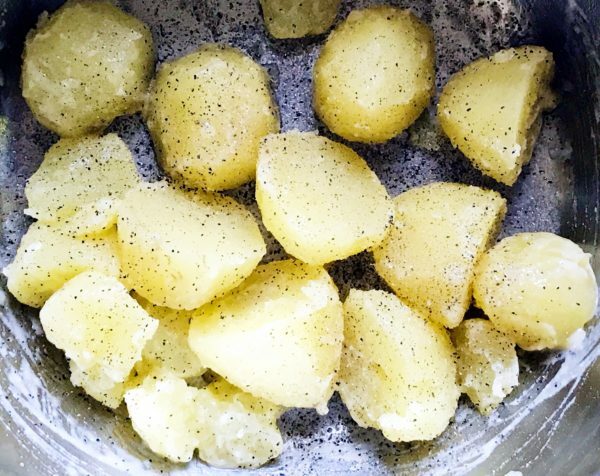 Allow butter to melt and gently stir potatoes in butter to coat. Remove from heat, set aside, and cover to keep warm. When the spareribs are done, carefully remove each slab from the water and place in a colander to drain excess liquid. Transfer to cutting board and using a sharp knife, separating the ribs into individual pieces. Carefully pour the sauerkraut from the pot into colander to drain out excess liquid. Transfer sauerkraut to a serving platter by spooning around the perimeter of platter. Place ribs in the middle of the platter. Remove potatoes from pan and distribute around the ribs. Serve with corn and a green salad. This meal is traditionally served with a fresh green salad and buttered bread. A favorite bonus with this meal is to create a sauerkraut sandwich by buttering a piece of white bread, folding in half, and filling it with sauerkraut for a delicious sauerkraut sandwich. Choose ribs that are pinkish-red in color with some marbling in the meat. Choose ribs with plenty of visual fat on the meat for tenderness and flavor. The longer pork ribs cook the more tender the meat will be. Use a fork to test the tenderness of the meat. Continue to allow it to slow cook up to an extra 30 minutes if the meat is not tender enough. Raw organic sauerkraut is best since it does not have the preservatives or nitrates found in other bottled sauerkraut. Isn’t wonderful to experience the nostalgic taste of our mother’s cooking from days gone by? So glad you found the recipe! I would love to hear it turns out for you. Enjoy! I made sauerkraut, baby back ribs and mashed potatoes !! I am so happy you and your family enjoyed the recipe! It was one of my mother’s specialties and she would have been thrilled to hear that you tried it and love it. I always love to hear feedback and appreciate you taking the time to share your results. Have a beautiful rest of the day! Always have mashed potatoes. Don’t brown the ribs either. One of the favorite of my husband. Oh, I love mashed potatoes with spareribs too! Yes, you are right. You don’t need to brown the ribs since they are boiled. I’m so glad you found the recipe! I hope your husband enjoys the recipe as much as I do!